Hercule Poirot made his first appearance in Agatha Christie's "The Mysterious Affair At Styles" in Christie's first book, published in 1920. With this amazing mystery novel, the Queen of Crime began her illustrious literary career. At the time, Christie was working in a dispensary, doing her part to support Britain's valiant war effort on the home front while her husband, Archie Christie, was serving with the RAF. Written to win a 'dare' challenged by her sister, Christie little knew that her funny little Belgium detective would be the catalyst that would shape her long and extraordinary career. The rest, as they say, is history. Agatha Christie went on to become the world's most prolific and popular author of mystery books and her two most famous detective's, Hercule Poirot and Miss Jane Marple have become as well known as Christie herself. In her first book, The Mysterious Affair at Styles, a likable but somewhat adrift Captain Hastings is recuperating from a war injury while staying at the country estate of the Inglethorpes. Emily Inglethorpe, the family matriarch, is found poisoned. The family, in shock and at a loss of what to do turns to their house guest, Arthur Hastings, for advice. Captain Hastings recalls the amazing detective skills of a chap he met in Belgium, Hercule Poirot. Poirot, explained Hastings, had an extraordinary gift for observing even the smallest detail and then using what he called, "his little gray cells," to organize clues into the solutions that catch criminals. Hastings calls in Hercule Poirot to help unravel the mystery. Poirot, as fate would have it, is living quite near by, grateful to England for offering war refugees, like himself, a refuge. Poirot eagerly responds to the challenge of solving the case of who could have murdered an elderly and generous woman like Emily Inglethorpe. 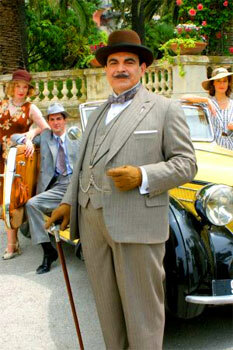 Poirot is an almost comical character to the eye. Short, slightly rotund, persnickety about his appearance, vain, sometimes arrogant, with an egg-shaped head and extraordinary mustaches. He is a fussy little man...but it is in the details that he sees what others do not. "The little gray cells, my good Hastings," he explains. They are what Papa Poirot has that others do not!" Indeed, Poirot's quick eye and intelligence solve the case before his friend, Inspector Japp of Scotland Yard can even understand what's what. The faithful Hastings is always on hand to lend some comic relief and to chronicle the exploits of the Belgian detective. The trio appeared in dozens of short stories and novels written by Dame Agatha Christie, as well as in plays, radio, television and movies. Among the most memorable actors to portray Poirot are Albert Finney, Peter Ustinov and David Suchet. Visit our Hercule Poirot Book Reviews Index. Read our biographies of Agatha Christie & Miss Jane Marple.